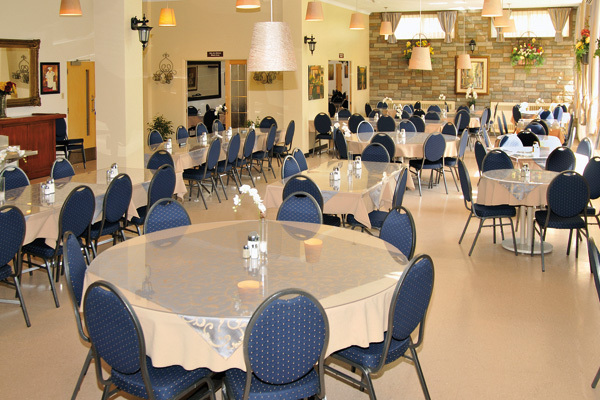 Manoir D’Youville offers a variety of food services for hotel guests and meeting room clients. The kitchen staff attentively prepares all meals using only the finest ingredients, which are often sourced from the surrounding area. The Manoir’s dining room menu features a variety of healthy choices, such as chicken breast in a mushroom and wine sauce, Asian beef stirfry, seafood vol-au-vent, and vegetarian lasagna. Meals are served buffet-style, and include soup, salad bar, two main meals with seasonal vegetables, of which on vegetarian choice, dessert, and beverages (coffee, tea, herbal tea and juice). A banquet service is available to groups who rent halls for conferences business meetings or private events. From a cold buffet to a four-course hot meal, the team will impress and delight you with the quality and originality of their dishes and their impeccable service! On the premises, you will also find our Bistro La Traite, where you can discover a vaste choice of local products and flavours, with 30 Québec beers on tap, as well as a selection of ciders and wines. Clic here for more infos.